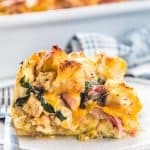 Thanksgiving Leftover Strata - Transform your Thanksgiving leftovers into this layered casserole with pockets of gooey cheese, cranberry sauce, turkey, French toast filling, and gravy-soaked croutons on top! Place the cubed bread in a bowl and drizzle the olive oil (2 tbsp first and more as needed), add the minced garlic cloves and toss to combine. Place the bread cubes on a baking tray or roasting pan, and allow the bread to roast in the oven for about 20 - 30 minutes, while tossing them occasionally. When the bread cubes are fairly dry and crisp (but not colored), remove from the oven and let them cool down. While the bread cubes are cooling down, prepare the gravy. Put the gravy in a small saucepan or a microwave-safe bowl. Heat until hot, but not boiling. Add the cheese and stir in gently to partially melt the cheese. The cheese should not be completely melted. Set aside until needed. Add all the eggs, milk, salt and black pepper into a large bowl and whisk until smooth. Set aside until needed. Chop the thyme and rosemary together and place in a small bowl. Put all of the other fillings in separate bowls as well. Generously butter a 9 x 13 inch baking pan or casserole dish. Place half of the bread cubes on the bottom of the prepared pan/dish. Sprinkle half of the chopped herbs over the bread. Next, add HALF of the turkey and HALF of the bacon on top of the bread layer, followed by HALF of the cheese. Add HALF of the sliced onions, then dollop HALF of the cranberry sauce, followed by all of the sauteed greens of your choice (you can leave out the greens if you like). Then layer the remaining ingredients in the same order (turkey, bacon, cheese, onion and cranberry sauce). Top it all off with the rest of the bread cubes, chopped herbs and black pepper (optional). Evenly pour the EGG MIX over the bread. Use a spatula to gently press the mixture into the dish. Finally, evenly pour the cheesy gravy over the bread cubes. If you don’t have gravy, you can just sprinkle some cheese on top instead. Cover the dish and let the strata soak up all the flavor for at least 1 hour. You can also cover the dish and refrigerate it for up to 24 hours at this point. Bake the strata in the oven (uncovered) for 45 - 50 minutes. Check on the strata half way through, and again occasionally after that. Cover the strata with foil if the bread layer on top is browning too much. Remove the strata from the oven, and let it rest for about 10 minutes. Serve warm. If you don't have leftover gravy, you can skip this and just add grated cheese over the bread layer on top instead. This strata is very adaptable, you can adjust the filling to use up whatever leftovers you have at hand. If you have mashed potatoes, you can add this as a layer as well. Just dollop in the mashed potatoes, rather than spreading it as a thick layer. If you have ham, you can add that instead of bacon.